On Stranger Tides follows the exploits of John “Jack Shandy” Chandagnac, who travels to the new world after the death of his puppeteer father to confront his uncle, who has apparently made off with the family fortune. 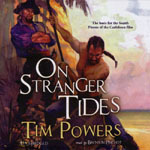 During the voyage, he befriends Beth Hurwood and her father Benjamin Hurwood, an Oxford professor. Before they arrive at their destination, their ship is waylaid by Blackbeard (via Davies) and his band of pirates. With the help of the professor and his assistant, the captain is killed and Chandagnac is pressed into piracy and sorcery as Blackbeard searches for the Fountain of Lost Youth (and other nefarious goals). Chandagnac, newly dubbed “Jack Shandy,” must stop the evil plot and save Beth Hurwood. I was all set to buy the audiobook, when I found an iPhone app for half as much. The app has some problems though. The sleep function only works when you disable locking on the phone. So if you fall asleep, you might get screen-burn. Also, frequently the app would lose its place in the current chapter, and if I didn’t write down my place in Simplenote app, I would have had to start the chapter over. Otherwise it was a bargain. I have some reservations with this book as an audiobook. Bronson Pinchot is very dramatic in his reading of the dense text, but if you’re in your car or walking in public with some ambient noise, some of the whispering (Blackbeard), mumbling, and toothless (Skank) characters may be hard to hear. Plus, the plot is so Byzantine, if you miss some important piece of information, you may not know what is going on later on, and get bored. And watch out because some of the characters have multiple names, like Blackbeard may also be called Thatch or Hunzie Conzo (? ), and others. Hurwood and Shandy’s uncle assume different identities as well. Even ships like the Vociferous Carmichael may change their identities. This link may help (possible spoilers). (Help me, Wikipedia, with a better plot summary.) By the way, this is how you spell ‘Bocor’ (“Hatian witchdoctor”). You’ll want to google it . I’m still not sure what a ‘loa’ is. Plus you have to watch out for scenes that only take place in fantasy, or within characters’ minds. I found much more enjoyment when I listened to the book in a quiet room and actually took notes. But it took a little more effort than I want from a novel. The characters didn’t seem to have much depth to me, except maybe the evil zophtig Leo Friend. So the plot is the highlight, and there are some good scenes toward the end, some memorable death and puppetry. 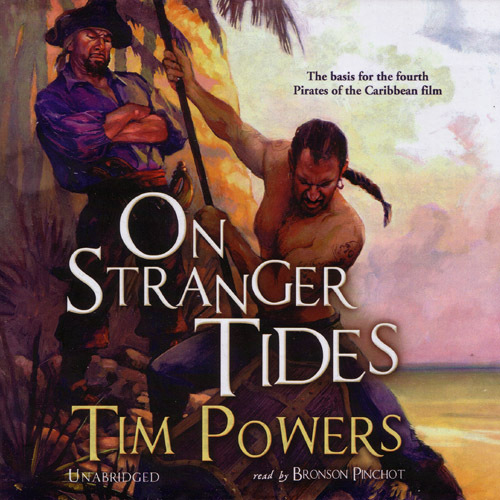 Also, listening to Tim Powers’ 2010 interview (scroll down) on the Agony Column helped me appreciate the book more. He talks about this book around the 8 minute mark. His method is to research and find ’20 cool true things’ and string them together into a novel. (Yes, Blackbeard was real.) If only the book had a nice appendix. Remember, never eat a chicken with writing on the beak. You leave out a point which may interest people: This is the basis for the newest “Pirates of the Caribbean” film. I’m patiently waiting for a Bocor wikipedia entry.